By critiquing western-centric and orientalist scholarship surrounding North Korea, particularly works by Victor Cha, postage stamps show the complex but interesting nature of North Korean identity. Utilising works by Charles Armstrong and Andrei Lankov to provide historical context and works by Ross King and Gabriel Jonsson to provide philatelic theory needed for analysing postage stamps, North Korean postage stamps provide a useful insight into the country’s national identity. By using sources from the Wilson Centre Digital Archive and Kim Il-sung’s Selected Works to add depth to the analysis, the layers of complexity surrounding the development of national identity 1948-1970 were unravelled and analysed, showing four main themes of national identity; nationalism, anti-imperialism/Americanism, Juche ideology, and Kim Il-sung’s personality cult. These four themes flowed through the period of study, at times some being more present. Immediately following North Korea’s founding in 1948, nationalism and anti-imperialism/Americanism were used to oppose the South Korean government and portray Kim Il-sung’s North Korean government as the legitimate Korean government. In philately, the significance of Pyongyang and naming North Korea Chosun was instrumental in developing nationalism to oppose South Korea. Monuments to anti-imperialism and gratitude to Russia served as political tools to spite American influence in the region. These sentiments prepared North Korea for a failed war for reunification. Despite this failure, sentiments of anti-imperialism/Americanism intensified on postage stamps. 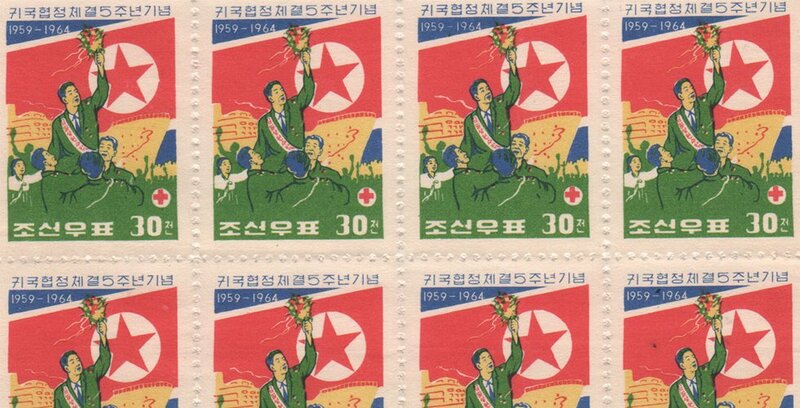 the capture of Seoul and defacing South Korean postage stamps, naming them the inferior republic, presented a short-lived victory of socialism over western capitalism. The destruction of North Korea during the Korean War prompted sentiments of economic nationalism, which led to economic stability. Furthermore, threats to Kim Il-sung’s leadership, following the de-Stalinisation campaign and attempted coup in 1956, brought Juche ideology and Kim Il-sung’s personality cult into North Korean national identity. In postage stamps, economic nationalism was presented through images glorifying unnamed Korean workers and scenes of reconstruction. The five-year plan intensified this identity, as the Chollima Movement, present on postage stamps, made reconstruction Korea-centric. The introduction of Juche, self-reliance, ideology in 1955 allowed Kim Il-sung to purge real and imagined threats to his leadership and consolidate power, using the backdrop of the Sino-Soviet Split to avoid severe backlashes from China and Russia. In philately, places of education which championed the development of Juche were venerated. Following the failed 1956 coup, Kim Il-sung furthered his Stalinist-style personality cult, thereby protecting his position. Philatelic imagery presented romanticised depictions of Kim’s life, especially his guerrilla struggles, to show him as ideologically independent and strong enough to lead Korea without outside influences. After this consolidation of political power and a successful reconstruction of the country, new challenges to North Korea in East Asia arose, prompting nationalism and anti-imperialism/Americanism to re-emerge. The Chinese Cultural Revolution forced nationalist identity to prominence once again, as North Korea used cultural artefacts on postage stamps to prevent the destruction of history in Korea. However, the normalisation of relations with China affected Kim’s personality cult, as the resumed cultural exchanges altered how he was presented. Maoist-style images of Kim emerged in propaganda, including postage stamps, showing a resumption of friendly relations between the two countries. The commemoration of anti-Japanese protests on postage stamps and attacks on America cultivated anti-imperialist/American and personality cultism in North Korean identity. Kim Il-sung used his families supposed historic legacy of anti-imperialist/American activity to justify attacks on South Korea in January 1968. Looking beyond 1970, following the physical outbursts of anti-Americanism/imperialism and remedied relations with China, North Korea was seen as a model socialist state. Kim Il-sung began to pursue international relations, both economically and politically, with the western and third world. This led to Juche playing a more significant role in North Korea’s identity, as the country attempted to export this ideology to other socialist states. In addition, Kim Il-sung’s personality cult intensified, as his ideology influenced global socialist leaders. The intensification is also shown through Kim Jong-il being named as successor in 1980, turning North Korea into the world’s first and only hereditary socialist state. This paper assess how North Korean national identity has been presented through the country’s postage stamps, 1948-1970. It identifies four main themes of national identity; nationalism, anti-imperialism/Americanism, Kim Il-sung’s cult of personality, and Juche ideology. 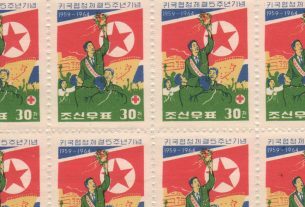 By contextualising these themes in North Korea’s history, this paper explores the complex but interesting nature of identity, as shown through postage stamps. In addition to postage stamps, this paper makes use of documents in the Wilson Centre Digital Archive and Kim Il-sung’s Selected Works to build the historical narrative. The political imagery and language present on North Korea’s stamps is critically assessed to argue how each of these themes have been presented over time. Furthermore, this paper challenges existing historiography on North Korea which is western-centric and orientalist. This scholarship tends to marginalise or ignore Korean identity in favour of demonising the regime. This paper begins with an explanation and critique of this, while also offering evaluations of historiography on Korea outside of this trend. 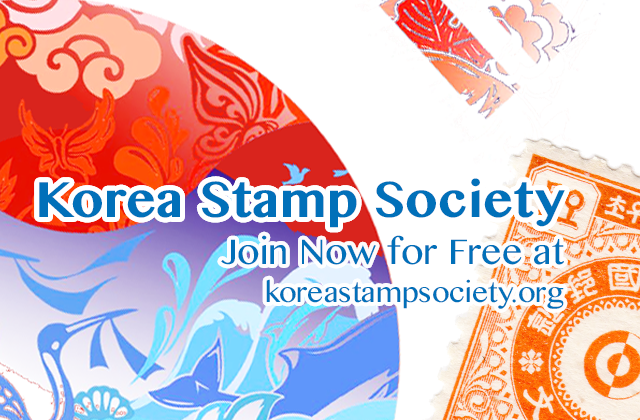 This paper also assesses works on philately and more specifically works on North Korean philately, to explore historiography on this topic to date and identify key areas of weakness in the current literature. 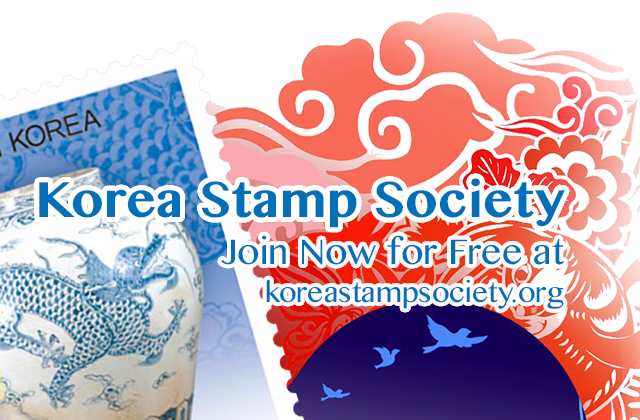 This paper therefore collates philatelic theory and works on Korean history to form an assessment of the postage stamps. This paper concludes that all four themes of national identity exist in North Korean postage stamps, 1948-1970. An evaluation is conducted on how these themes emerged, their significance, and presence on postage stamps. How these themes changed over time and influenced each other is also evaluated. Finally, this paper offers a brief concluding insight into the further development of North Korean identity post-1970 and how North Korea eventually became the world’s first and only hereditary socialist state, with the proclamation of Kim Jong-il as successor in 1980. In preparing and writing this paper, the author would like to take this opportunity to thank a number of individuals and organisations. Firstly, I would like to thank my supervisor, Dr Toby Lincoln, without whom this project would not have been possible. I owe you a large debt of gratitude for accepting to supervise a project outside of your normal research and supervision parameters. I would also like to thank Dr Jon Moran at the University of Leicester Politics and International Relations department for showing such interest in this topic and giving advice on readings and theories in the formative stages of this project. I would like to also thank members of the Leicester Philatelic Society, with which I have been a member since 2017. The support and interest given by members has been uplifting and I feel honoured to have be able to share parts of my collection and ideas with such knowledgeable members of the philatelic world. Last but not least I would like to thank my friends, colleagues, and family who have encouraged me throughout this project and endured many hours of my discussions on North Korean history and postage stamps. Below is a list of important individuals used in this paper. The majority of these come from documents in the Wilson Centre Digital Archive. To make sense for the reader the importance and possible obscurity of certain individuals referenced, their position and years of service (or approximate dates) are given. Brown, Frederick, to Harry Truman, 8 May 1945, Harry Truman Presidential Library <https://www.trumanlibrary.org/whistlestop/study_collections/koreanwar/documents/index.php?documentdate=1945-05-08&documentid=kr-1-1&pagenumber=1> [accessed 8 February 2018]. CIA Report, Postal and Telegraph Services: North Korea, 13 July 1953, CIA Library <https://www.cia.gov/library/readingroom/document/cia-rdp80-00810a001700380007-5> [accessed 10 January 2018]. Il, Nam, and William Kelly Harrison jr, ‘The Korean War Armistice Agreement’, 27 July 1953, United States Forces Korea <http://www.usfk.mil/Portals/105/Documents/SOFA/G_Agreement.pdf> [accessed 8 Match 2018]. Notes from a conversation between Joseph Stalin and Kim Il-sung, May 1950 <http://digitalarchive.wilsoncenter.org/document/114905> [accessed 8 March 2018]. United Nations Security Council, Resolution 82’, 25 June 1950 <http://digitalarchive.wilsoncenter.org/document/116190> [accessed 8 March 2018]. Telegram from CCPCC to Gao Gang, 18 July 1950 <http://digitalarchive.wilsoncentre.org/document/114204> [accessed 8 February 2018]. Telegram from Nikolai V. Roshchin to Joseph Stalin, 7 October 1950 <http://digitalarchive.wilsoncentre.org/document/117314> [accessed 8 February 2018]. Telegram from Zhou Enlai to Chai Junwu, 8 November 1950 <http://digitalarchive.wilsoncentre.org/document/114220> [accessed 8 February 2018]. Report from Góra Józef to PFM, 8 August 1952 <http://digitalarchive.wilsoncenter.org/document/114935> [accessed 8 March 2018]. Agreement between Zhou Enlai and Nam Il, 23 November 1953 <http://digitalarchive.wilsoncentre.org/document/114168> [accessed 8 February 2018]. Report from Victor Florescu to RFM, 29 September 1954 <http://digitalarchive.wilsoncentre.org/document/115539> [accessed 9 February 2018]. Memo from K. Koval to CPSUCC, 2 May 1956 <http://digitalarchive.wilsoncentre.org/document/120799> [accessed 9 February 2018]. Notes from a conversation between Vasily Ivanovich Ivanov and Choe Chang-ik, 8 June 1956 <http://digitalarchive.wilsoncentre.org/document/114132> [accessed 9 February 2018]. Diary of A. M. Petrov, 24 July 1956 <http://digitalarchive.wilsoncentre.org/document/113371> [accessed 8 February 2018]. Dairy of Vasily Ivanovich Ivanov, 29 August-14 September 1956 <http://digitalarchive.wilsoncentre.org/document/113373> [accessed 8 February 2018]. KWPCC, ‘Resolution of the Plenum of the Korean Workers’ Party’, 23 September 1956 <http://digitalarchive.wilsoncentre.org/document/120163> [accessed 8 February 2018]. Journal of A. M. Puzanov, 9 April 1957 <http://digitalarchive.wilsoncentre.org/document/115599> [accessed 9 February 2018]. Journal of A. M. Puzanov, 26-28 July 1957 <http://digitalarchive.wilsoncentre.org/document/115638> [accessed 9 February 2018]. Report from Li Fuchun to Zhou Enlai, 30 September 1957 <http://digitalarchive.wilsoncentre.org/document/114171> [accessed 9 February 2018]. Note by Jerzy Siedlecki, 14 May 1958 <http://digitalarchive.wilsoncentre.org/document/114973> [accessed 9 February 2018]. Memo by G. Samsonov, 18 August 1960 <http://digitalarchive.wilsoncentre.org/document/116333> [accessed 9 February 2018]. Schneidewind, Kurt, ‘The Influence of the Chinese Communist Party on the Policy of the Korean Workers’ Party’, 8 April 1963 <http://digitalarchive.wilsoncentre.org/document/110111> [accessed 7 February 2018]. Memo by A. Borunkov, 2 December 1966 <http://digitalarchive.wilsoncentre.org/document/114591> [accessed 8 February 2018]. Memo by A. Borunkov, 30 December 1966 <http://digitalarchive.wilsoncentre.org/document/1166692> [accessed 7 February 2018]. Report from the HE-C to HFM, 20 November 1967 <http://digitalarchive.wilsoncentre.org/document/116664> [accessed 7 February 2018]. Telegram from RE-P to RFM, 22 January 1968 <http://digitalarchive.wilsoncentre.org/document/113939> [accessed 7 February 2018]. Record of conversation between Andrei Andreyevich Gromyko and Kang Cheol-geon, 31 January 1968 <http://digitalarchive.wilsoncentre.org/document/110506> [accessed 7 February 2018]. Czechoslovak Government, ‘Information about the Situation in Korea’, 4 February 1968 <http://digitalarchive.wilsoncentre.org/document/114572> [accessed 7 February 2018]. Report by EGE-P, 3 March 1968 <http://digitalarchive.wilsoncentre.org/document/116655> [accessed 7 February 2018]. ‘Establishment of the People’s Republic’, 19 September 1948. ‘Fifth Anniversary of Liberation from Japan’, 20 June 1950. ‘Capture of Seoul by North Korean Forces’, 10 July 1950. ‘Korean People’s Inferior Republic Postage Stamp’, Overprinted South Korean Postage Stamp, c. July 1950. ‘Co-operation of Chinese People’s Volunteers’, 15 November 1951. ‘The 10th Anniversary of Kim Il-sung University’, 30 September 1956. ‘Opening of Hwanghae Iron Works’, 22 May 1958. ‘National Congress of the Innovators in Production’, 16 September 1958. ‘Revolutionary Leadership of Kim Il-sung’, 26 July 1960. ‘The 4th Korean Workers’ Party Congress’, 17 September 1961. ‘Uprising of 1919’, 10 February 1964. ‘The “General Sherman” Incident’, 28 September 1964. ‘Art Treasures of the Silla Dynasty’, 30 April 1966. ‘The 56th Anniversary of the Birth of Kim Il-sung’, 15 April 1968. ‘Anti-US Imperialism Journalists Conference, Pyongyang’, 18 September 1969. ‘Month of Struggle Against the USA’, 25 June 2008. Il-sung, Kim, Selected Works, Volume I (Pyongyang: Foreign Languages Publishing House, 1971). ‘On the Work of the Organizations at all levels of the Communist Party of North Korea’, 17 December 1945, pp. 10-22. ‘The Political Programme of the Government of the Democratic Peoples’ Republic of Korea’, 10 September 1948, pp. 270-275. ‘Every Effort for Victory in the War’, 26 June 1950, pp. 287-294. ‘On Some Questions of our Literature and Art’, 30 June 1951, pp. 305-312. ‘Everything for the Post-war Rehabilitation and Development of the National Economy’, 5 August 1953, pp. 413-462. ‘On Eliminating Dogmatism and Formalism and Establishing Juche in Ideological Work’, 28 December 1955, pp. 582-606. Il-sung, Kim, Selected Works, Volume IV (Pyongyang: Foreign Languages Publishing House, 1971). ‘The Present Situation and the Tasks of our Party’, 5 October 1966, pp. 332-420. ‘Let us Intensify the Anti-Imperialist, Anti-US Struggle’, 12 August 1967, pp. 538-545. Il-sung, Kim, Selected Works, Volume V (Pyongyang: Foreign Languages Publishing House, 1972). ‘On Correctly Implementing our Party’s Policy Towards Intellectuals’, 14 June 1968, pp. 98-129. Ho, Choe Kwang, ‘Stamps Showcase 70 Year of the DPRK’, in So Chol Nam (ed. ), Pictorial Korea (Pyongyang: Pictorial Korea, 2016), pp. 32-33. Rhee, Syngman, Neutrality as Influenced by the United States (Princeton: Princeton University Press, 1912). Gyong, Baek Man, Victory of Juche: A Tribute to Kim Il Sung (Paris: Editions Jeune Afrique, 1972). Hwee, Moon Sung, ‘An In-Depth Look at North Korea’s Postal Service’, 18 April 2008, DailyNK <http://www.dailynk.com/english/read.php?cataId=nk00100&num=3499> [accessed 19 January 2018]. Eun-jung, Kim, ‘Funds to be raised for Syngman Rhee monument at Princeton Univ.’, 16 December 2012, The Korea Times <https://www.koreatimes.co.kr/www/news/special/2010/12/139_78119.html> [accessed 8 February 2018]. The Washington Post and Times Herald, ‘Foundry Minister to Honour Dr. Harris on Sunday’, 12 November 1954, The Washington Post and Times Herald. South Korean Postage Stamp, ‘Promulgation of Constitution’, 1 August 1948, Stampworld <https://www.stampworld.com/en/stamps/South-Korea/> [accessed 10 January 2018]. The White House, ‘Victor Cha’, George W Bush White House Archive <https://georgewbush-whitehouse.archives.gov/government/vcha-bio.html> [accessed 10 February 2018]. Stanley Gibbons, Stamp Catalogue Part 18: Japan and Korea, 5th ed. (London: Stanley Gibbons, 2008). Jin-sung, Jang, Dear Leader: North Korea’s Senior Propagandist Exposes Shocking Truths Behind the Regime, trans. Shirley Lee (London: Rider, 2014). Kim, Suki, Without You There is no us: My Secret Life Teaching the Sons of North Korea’s Elite (London: Rider, 2015).